Indeed, the setting is drop-dead gorgeous. The purple and rusty hues of the jagged Giganta Mountains sweep down to the pristine cobalt Sea of Cortez. French undersea explorer, Jacques Cousteau, called this federally protected marine park “the World’s aquarium.” The five islands of Loreto create a sanctuary for more than 1,000 species of marine life. From the signature 17th par-three hole, on the crest of a rocky peninsula that drops off to the sea 250 feet below on three sides, you are likely to spot dolphins, whales or blue-footed boobies. It’s difficult to concentrate on projecting your Titleist over the cliffs and down onto the green, yoked by a horseshoe-shaped bunker, when you are surrounded by such gob-smacking natural beauty. Imagine Sedona’s rocky pinnacles and stately cacti surrounded by a true blue Hawaiian surf. 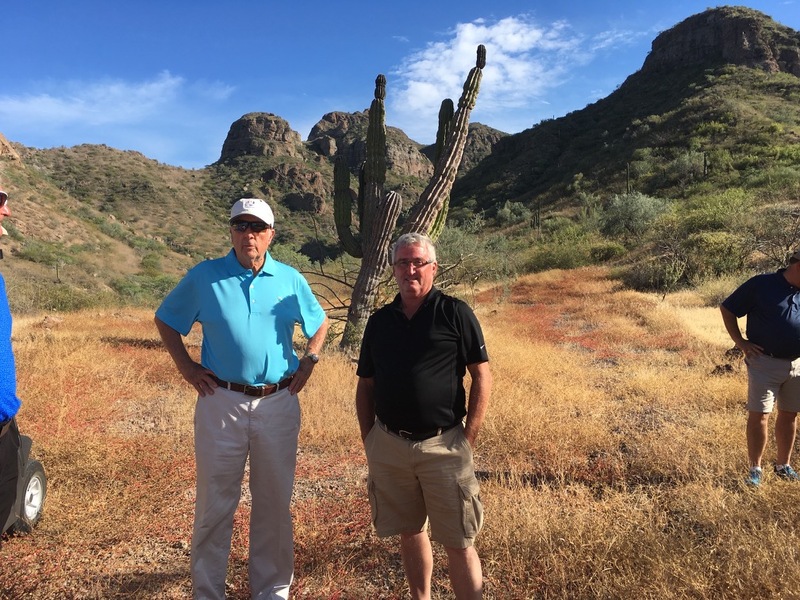 Although he admits that, “this must be the most adverse landscape I’ve ever tackled,” Jones has managed to a tame the desert and mountains and create a course that’s fun for both high and low handicappers with room for errant shots. “Make it enjoyable,” were Jones’ marching orders from owner Owen Perry, who discovered this piece of land about ten years ago. In 2009 he opened Villa del Palmar Beach Resort & Spa and began master planning the Danzante Bay community. Today the resort features three restaurants, five swimming pools, tennis courts, beach club, spa and gym, driving range and eleven golf holes. The remaining seven, to be etched in the floor of a canyon, will be completed by November 2017 bringing the course to 7,107 yards. Finesse, not length, is the key to a good score here. Future plans include 140 homes and a boutique hotel. Unearthing the course also involved a considerable amount of dynamite.Perry has given Jones the luxury of taking time to plan and replan the routing of Danzante Bay. The dazzling number 17, for example, wasn’t part of the original plan, but when Jones and his team found the precarious cliffside perch, they were thrilled that Perry agreed they could build a hole there. “It was like manna from heaven,” said Jones. Although number 17 steals the show, the other fairways at Danzante take players through a variety of settings, including valleys, arroyos, dunes and foothills. In many ways the course pays homage to how golf originated—at the place where the land meets the sea. Jones has also kept the green contours mild so the putting surfaces are manageable in the wind, which is a constant factor. 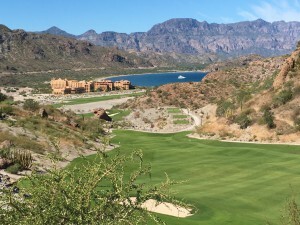 Whereas Los Cabos, at the tip of the Baja Peninsula, attracts folks looking for glamour and robust nightlife, the Loreto area draws a crowd more interested in peace, quiet and nature. Don’t be surprised if the bar at Villa del Palmar closes before 10 p.m. And if the WI-FI doesn’t work in your suite, remember you came here to chill. Anglers come for the trophy marlin, sailfish and dorado. Hikers and mountain bikers encounter no lack of desert trails. Water babies at Villa del Palmar can enjoy the resort’s kayaks and paddle boards. 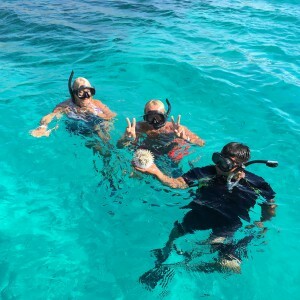 The snorkeling is about as good as it gets. 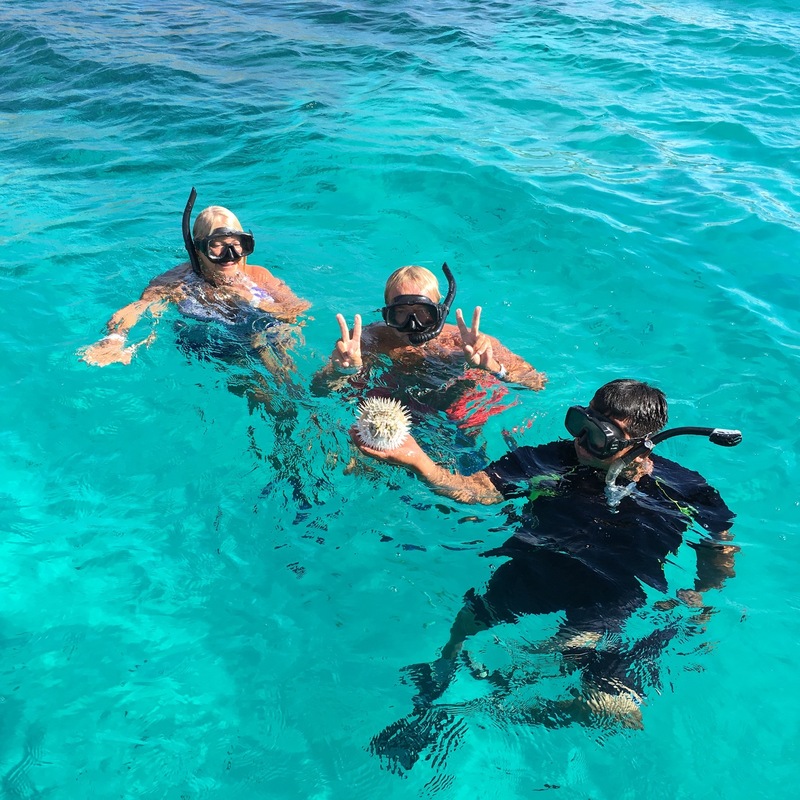 Captain Paul took a group of us out to Del Carmen Island in his zodiac. We swam in the crystal-clear Sea of Cortez that was teaming with a kaleidoscope of marine marvels. Playful dolphins escorted us back to the resort. Named one of Mexico’s best spas by SpaFinder, the immense 3900 square-foot Sabila Spa offers more ways to relax. The wet area features myriad bubbling Jacuzzis, steam room, sauna and special Epsom salts and aloe vera baths. The therapists offer massages specially created to sooth both golfers’ and anglers’ aching muscles. 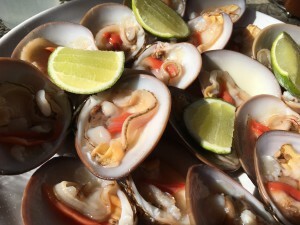 The resort’s Casa Mia and Danzante restaurants dish up tasty Mexican classics and wonderfully fresh seafood. I highly recommend Mezcal-steamed lobster and the Loreto clams, either raw with a squirt of lemon or baked Rockefeller-style with spinach and cheese. There’s also a handy market where guests can pick up groceries, beer and liquor. 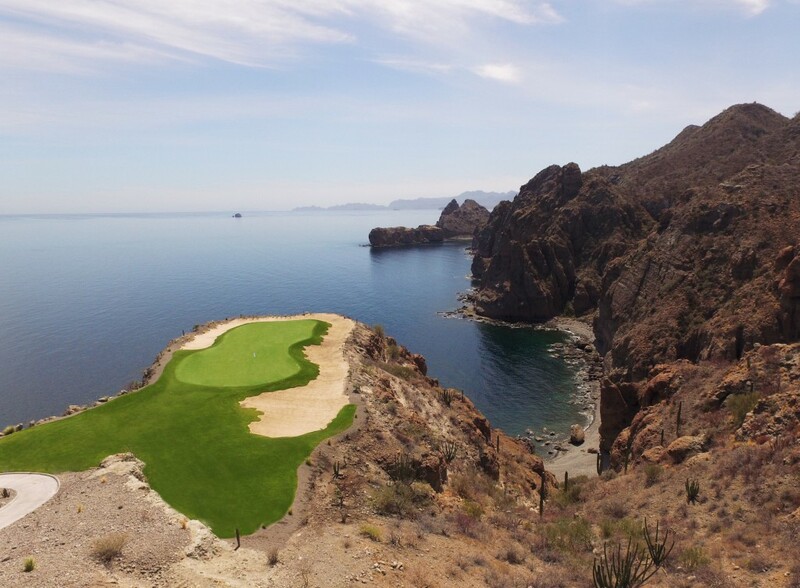 I hope to return to Danzante Bay next fall to play the full 18 holes. 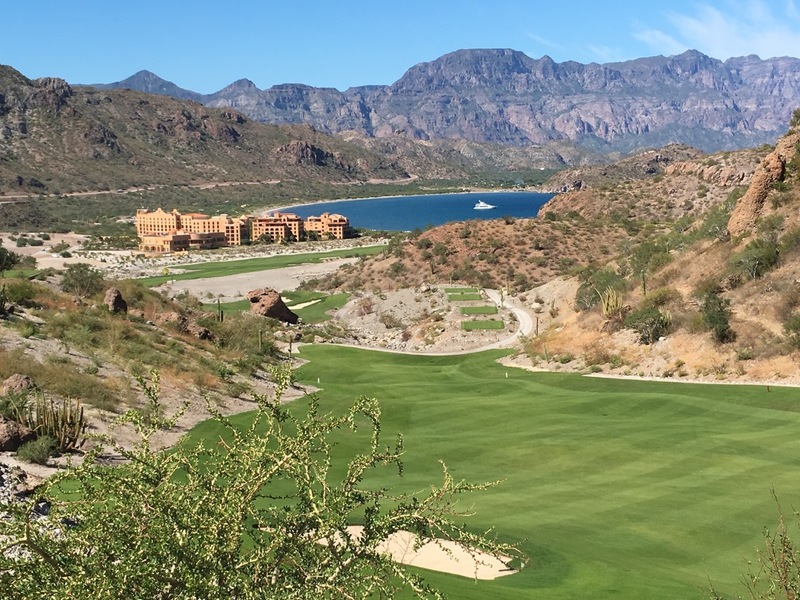 But in the meantime, I encourage my fellow golfers to go now, enjoy the eleven completed fairways, the genuine hospitality of Villa del Palmar and the unspoiled beauty of the Sea of Cortez. Danzante Bay is located about 40 kilometres south of the town of Loreto. From Los Angeles Airport, it is less than a two-hour flight on Alaska Airlines. WestJet also flies direct from Calgary in the winter.